Ever since I delved into the skincare world I learned a few things about skincare which I normally would have no idea of. I learned a bit about which ingredients work well for my skin type and condition. I also learned about different ingredients for different skin problems and conditions, which ingredients should use together and which ones that are not supposed to be used together. I also learned that you have to always wear sunscreen when you use actives, and when you use sunscreen during the day then you should double cleanse your face at night so you won't get clogged pores. There are other things that I have learned but one thing I keep remembering is to combine Vitamin E products with Vitamin C because they go well together and using them both would bring greater result. And I have tested the Vit E + Vit C combination routine and put them in my skincare regime, and I have proven that they are one of the best ingredients combo out there. Guaranteed to make your skin looks even brighter and more supple - healthy looking. Especially if you use them frequently. I have reviewed each of those product separately (click the link above to go to each review page) and I have found that using those products at the same time really benefit my skin. I usually put on the TBS Vit E Overnight Serum first because it has an oil texture, and then followed by applying the OST C20 Vit C Creme after waiting for a couple minutes. I only use these duo combo at night and the next morning my skin would look all healthy, supple, smooth, and brighter after my morning wash. Definitely making me look like I have a good night sleep when in reality I only slept for 5 hours. 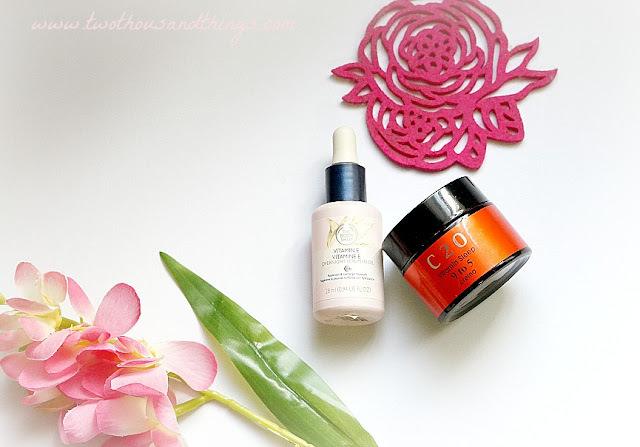 Before using the C20 Vitamin Sleep Creme above, I used to always combined the TBS Vit E Serum / Oil with the C20 Pure Vit C Serum (and that combo works very well too! ), but now I'm out of the serum so I'm using the Creme instead and they both work really well with my skin and gave the same brighter supple skin effect in the morning. So, do you also have a favourite skincare combination that works well for your skin?